A Legacy of Hearts, Darkness, and Zippers. For fans of the series, especially those that have consumed each of the near dozen Kingdom Hearts games, Kingdom Hearts 3 is a celebration of the series, a culmination of nearly every plot thread the series has left untold. For newcomers, it can often be confusing in knowing who is who and the overall narrative at play, often having to sit through story recap videos or having your friends get you up to speed, or at least, attempt to. While I am mostly a newcomer to the series myself, after only playing portions of the two main PS2 outings, I still managed to find this long awaited sequel to be a masterwork of fun and adventure, even if I did find several aspects of the game to be less than impressive. I will stress that from the onset that this is designed as a review more catered to the type of player not associated with the Kingdom Hearts franchise or those that are still on the fence about it. I would assume that the diehard fan has already purchased the game and are attempting to 100% complete it as I type these words. As a partial newcomer to the series, I wanted to put out a review for the game as while I was sort of out of the loop on who some of the characters were, I still had a really enjoyable time with the game; with some slight problems aside, but we shall get to those in due time. For anyone that assumes that a franchise should only be reviewed by a fan of the source material, keep in mind that bias and nostalgia can often lead to disingenuous opinions. If you are looking for a story refresher, that’s something that I don’t think I am capable of explaining. While I’ve read several story recaps, Polygon’s one here is by far the best and easiest to understand and so I would start there if you are still unsure about the goings-on of Kingdom Hearts lore. I also suggest watching a few recap videos or using the tools in the game itself to get up to speed on the massive amount of story that predates this title. What is odd about how Square Enix has handled the series is that the spin-offs available on the GBA, DS, PSP, and mobile devices, feature some very crucial aspects to the story here, so if Kingdom Hearts 1 and 2 are the only entries of the series you’ve played, then prepare to do a lot of catch up. Thankfully, if you were to nab the PS4 collections, those editions have more than enough content to make you a Kingdom Hearts expert in no time. To give you a general idea of the story featured in this 3rd main entry of the series, a evil man named Xehanort is attempting to re-create an ancient battle called the Key Blade war. Xehanort does this so that he can wield the χ-blade, the original Keyblade and the very tool used to unlock Kingdom Hearts, which is essentially the heart of all worlds. The series has been about him making all the moves required to make this happen. As Sora, you are joined by Goofy and Donald Duck in an effort to stop him before he can put this plan into motion. Unfortunately, for Sora, he is vastly depowered since his last adventure and must figure out how to regain much of his power back before he can even face Xehanort in battle. Sora will reclaim what was lost by visiting several Disney worlds such as Toy Story, Frozen, Tangled, Pirates of the Caribbean, and more. While some of these worlds look to simply recreate their movies, albeit with your assistance throughout, a few of them take place before or after certain films, allowing them to be far less predictable in their narrative. Now, that being said, I have some issues with how certain worlds handle their adaptation of each properties story. Frozen, Tangled, and Pirates of the Caribbean were the Disney worlds that I found the most fun to run around in and team-up with their respective characters; however, they are missing huge chunks of their own stories to make their narrative make sense. While they couldn’t obviously retell the entirety of each movie, those who haven’t seen the films will have a tough time understanding how Flynn returned midway through the story, or who that guy taking Elsa back to the palace was; moments that are merely glossed over here. While I did enjoy the Monsters Inc. content, It’s not a movie that I am particularly that fond of. In fact, I’m not a huge Pixar fan (with the exception of Coco and Brave), which is why the Toy Story level also left me largely bored, that and having the music to “You’ve got a friend in me” being in the background the whole F’ing time was enough to make me start drinking. The story here is very intricate and complex when it has to do with Organization XIII, who are essentially the villains of the piece. While the Disney worlds and the stories built into them are very simplistic, there starts to be a pattern to how each world plays out. When you start each of the main Disney locations, you’ll meet up and join the characters of that world. Eventually, you’ll encounter a member of the Organization that is designated to watch that world. You will banter back and forth, have some fairly awkward conversations about hearts, darkness, and the light, and wrap up that location with a boss battle. This is more-or-less the routine through each world, getting bits and pieces of the overarching plot sprinkled in here and there. While you’ll most often play as Sora, joined at the hip with Goofy and Donald, you will also jump into the shoes of a few other characters as well as they too have a job to do towards their part in stopping Xehanort. As you can more or less choose from a few worlds at a time, much of the story sits until you’re able to progress to the next chapter. This means that the story can feel like it’s not going anywhere drastic for long stretches of play. It’s not a bad thing per say, but it is something to point out. This can also cause the game to have some odd pacing due to how each world has its own tone and how the story is structured. This next sentence does feature a mild spoiler, so I’ll keep it very vague. The pacing is particularly painful in the final few hours once an event happens that has Sora on his own for a bit. This moment causes the game to come to a screeching halt after some intense moments of action. While there were small pacing issues leading up to certain moments in the story, it was here where the game felt like it needed to pull over to the side of the road for a rest. 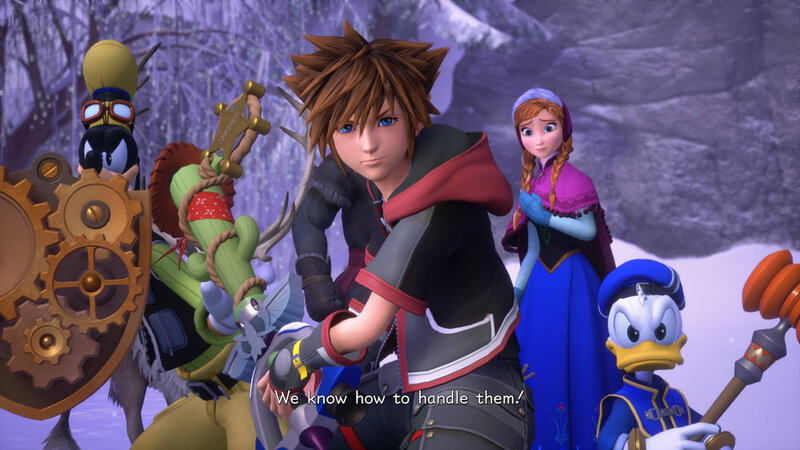 While much of the appeal of a game like Kingdom Hearts is about its connection and use of Disney and Pixar characters like Elsa, Buzz Lightyear, Mickey, and Jack Sparrow, the game is also filled with characters that exist solely in Kingdom Hearts. As this is a wrap up to a story that started some 18 years ago, there are not many characters new to the game itself. When Kingdom Hearts first was shown off, it was a mixture of Final Fantasy and Disney and Kingdom Hearts 3 is almost non-existent on its inclusion of any characters from Final Fantasy. Depending on how invested you are into the series, many of the supporting characters will either entertain you, or have you confused as to who they are, despite everyone in the game knowing full well their identity. I did find that pretty much every character had at least something to do and even the inclusion of the kids from Twilight Town; Olette, Haynor, and Pence, had some fun moments as well. About the only character that I felt was really lacking in consistency was Buzz Lightyear. During the Toy Story level, he is often hesitant about trusting you, as he merely wants to wait for Andy to return, whereas Woody wants to travel with Sora and company to go find their friends. Buzz consistently flip-flops from trusting you, to not, to being your friend, to not trusting you, over and over again. It is the only moment in the game where I was frustrated with a character. The way you travel to each world is one aspect of the series that I’ve never enjoyed and Kingdom Hearts 3 doesn’t aim to improve that experience, for the most part. You travel to new worlds using a Gummi Ship, a ship composed of Gummi blocks that allows transportation between those worlds. While you can use your easily earned currency to purchase new ships, you can unlock a variety of items to construct your own. These segments feature a type of space travel between locations that has you entering in spacial rifts, dodging obstacles, and fighting bosses with your on-board arsenal. Apart from one frustrating encounter, the combat here is fairly simple and the whole package is uninspiring and feels as if it was added simply because it was already part of the franchise. There is nothing here that drives the mechanic forward into anything worthwhile. Apart from convoluted storylines about time travel and the ability to separate one’s heart from their body, Kingdom Hearts 3 excels through its fast paced combat. As Sora, and a few others, combat generally remains the same across each character you will control. While several encounters can be solved with repeatedly pressing a single button over and over again, higher difficulties and the more challenging battles will have you taking advantage of several other systems. To simplify the discussion around combat, I’ll be referencing its use through Sora exclusively for the remainder of the review as he is your main focus through the entire game. Sora has the use of not just his Keyblade, which you’ll collect a variety of them during your time here, but the ability to cast typical Final Fantasy spells like Fira, Blizzaga, Aero, Cura, and more. You’ll start with the most basic versions of these skills and eventually unlock the more potent ones as time goes on. Each Keyblade has special attacks that are built up the more you use it in battle. The Keyblade earned through completing the Frozen world of Arendale is the one blade I found to be the most effective and the one I mained for nearly 8 hours of my 34+ hours with the game. Each Keyblade has what is called Formchanges. 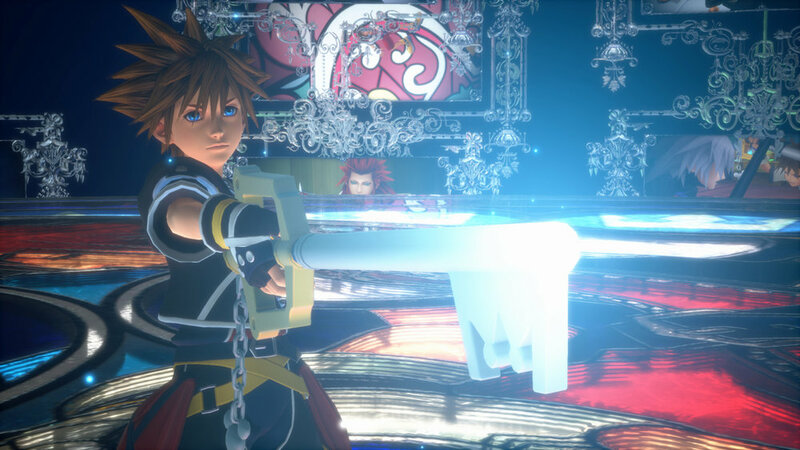 Crystal Snow, the Frozen-based Keyblade has a Formchange that converts the blade into blades of ice that are attached to Sora’s arms and feet and will freeze enemies in their tracks. As you continue to use that attack, you’ll then be able to trigger the special attack, and in the case of Crystal Snow, you produce a massive ice crystal that damages enemies that are caught all around it. Each Keyblade has its own abilities and finishing attacks, so finding the one that works best given the situation is key, quite literally. You will encounter enemies that have a timed green circle displayed on them fairly frequently and attacking them before the time runs out will grant you access to the Disney theme park attractions. These rides, which are called “Attraction Flow” are powerful attacks that can result in the decimation of anything that is nearby. You can summon a swinging Pirate Ship inspired by the Sailing Ship Columbia, The Mad Tea Cups, Big Magic Mountain, and more. These attacks are visual spectacles, for the most part, and are really fun to pull off. Other special attacks are through what are called Link Summons. 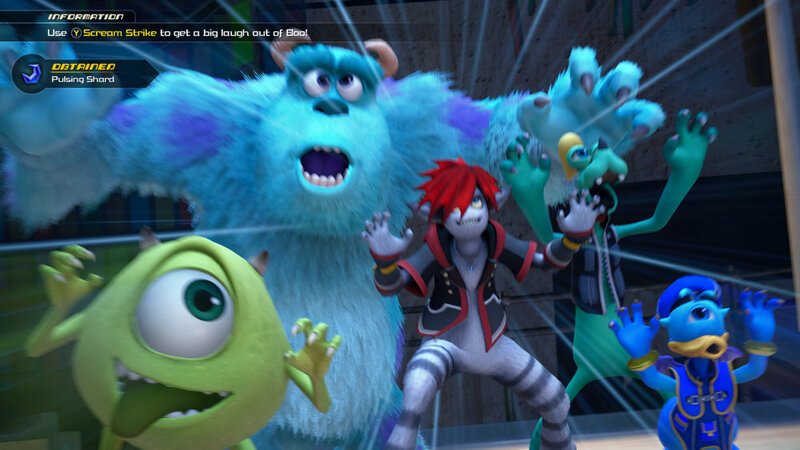 These attacks have you summon Ariel, Ralph, Simba, Stitch, and Meow Wow, a Dream Eater that was featured in Kingdom Hearts 3D: Dream Drop Distance. While Simba is a summon that I used quite frequently, and one that ended the life of several bosses, the other summons feel entirely wasteful and pointless. While I am sure there are aspects to each one that make them useful, I simply couldn’t get them to do what I wanted and ended up having Simba as my go-to damage dealer. The final aspects of combat are the team up attacks you have with Donald and Goofy and the Shotlock skills that return from Kingdom Hearts: Birth by Sleep. Team up attacks have you essentially joining forces with Donald or Goofy to bring the pain in one way or another. Each character has two attacks that vary from Goofy and company ramming enemies with his shield, to Donald and Sora unleashing dozens of fireworks to nearby foes. These attacks are rather fun, I just wish there was more of them. Shotlock is something that I used fairly often and then forgot about it for long stretches of time. Shotlock is essentially a targeting system where you’ll hold your cursor over the enemy while time is ticking away. By locking on to either numerous enemies or just one single one long enough, you’ll trigger different attacks across the variety of different Keyblades you’ll collect and upgrade. When a game that has been delayed or has seen a extensive development cycle, it can often feel incredibly dated both mechanically and visually. Thankfully, Kingdom Hearts 3 is a very good looking title that is incredibly gorgeous at times. 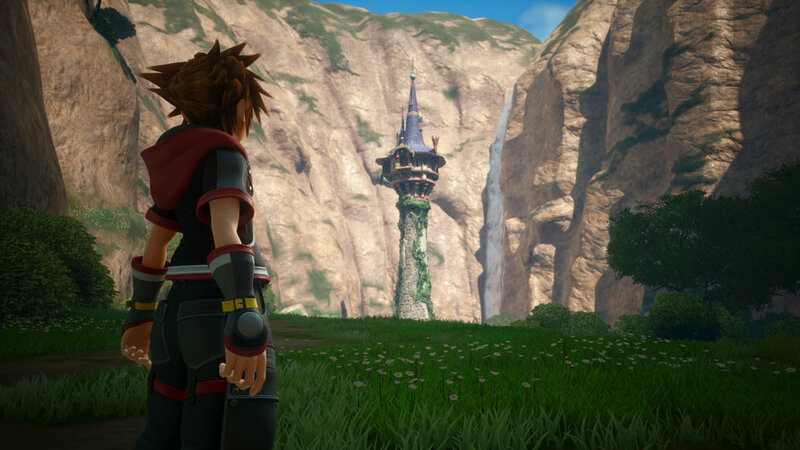 With the title featuring both Square Enix and Disney characters, I do still feel that the Disney side of the visuals are the more impressive, and that may also come down to their timeless designs in both characters and their environments. The character models for Donald and Goofy are insanely good, as are the costumes they both gain when visiting a few worlds, and this is also reflective of Sora as well, who has a few unique looks himself, even if some worlds didn’t offer up anything fun for the trio to wear. I will say that design-wise, I still can’t make sense of why Pete has a large zipper that starts at his belly and then wraps down and around to his back. It’s the type of outfit that seems like it should come with its own safe word. With having a very iconic cast of characters who are known for not only their visual identity, the sound of their voice is equally as recognizable as well. While a few voices are represented with their original voice actors, there are some exceptions where the voices are good to just plain awful. Mickey’s original voice actor unfortunately passed away back in 2009 and his replacement is ok at best. That, and it seems weird to hear Mickey spouting off long conversations. The replacement voices to Woody, Buzz, Jack Sparrow, Elizabeth Swan, and Scrooge McDuck, to just name a few, just don’t hit their impressions as often as they should. There are sometimes where Woody and Buzz are perfect, but it is very rare. Another issue with the sound present in Kingdom Hearts 3 is something I mentioned before; its music. 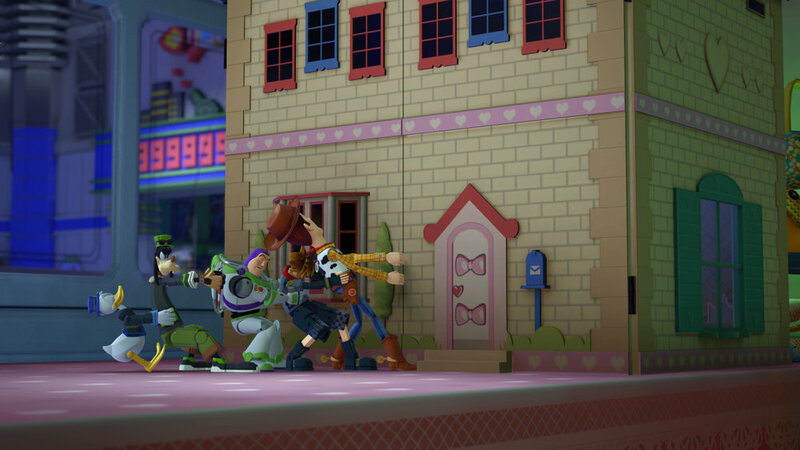 While some worlds have some different themes playing throughout, the Toy Story level seems obsessed with playing the chorus of “You’ve got a friend in me” again and again. While we are treated to the entire “Let it Go” song during a wonderful cutscene in Arendale, that world stills plays a few different songs to break up its musical choices. Apart from impersonations being very hit or miss, it is the normal dialogue interactions that can often feel awkward. There seems to be a weird delay in the conversing aspects to several conversations. Characters will be talking back and forth, but there is almost always a pause between dialogue, as if the game is loading up the next voice after the previous one has finished talking. This often led to poorly pacing moments when characters were spouting off very crucial exposition, or moments when Sora would be learning very important things from an Organization XIII member. I’m not sure exactly why this occurs, if it’s a glitch, or something that is working as intended, but I’ve checked numerous video playthroughs and discussions with friends and they all have the same experience. While it doesn’t happen all the time, it is far more frequent than not. While several moments of the game can feel like we’re being treated to a never-ending exposition dump, Kingdom Hearts 3 succeeds more often than it doesn’t. While that may sound like I have vast issues with the game, it’s quite the contrary. Amongst its convoluted and needlessly complicated narrative, lies a solid colorful adventure with enjoyable combat set across a wide range of memorable Disney worlds filled with its equally iconic cast of characters. Kingdom Hearts is a lot of things to many people, a franchise many quite literally grew up with. While it’s up to those who have completed it to tell you if it lived up to the hype, it is regardless a trip worth taking, even if you get a bit lost. Kingdom Hearts 3 was purchased by the reviewer.